A cavity can often be a painful problem, and if left unattended can spread decay. Compared to traditional metal fillings, white fillings or porcelain crowns are perfect to repair the damaged area of your tooth and are practically unnoticeable. With advances in modern dentistry services, tooth colored fillings are a wonderful option with numerous benefits. 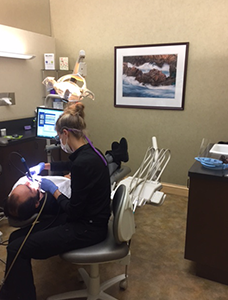 Dr. Dankworth also offers other solutions for restorations that involve cavities, including natural-looking porcelain crowns. Porcelain crowns are a type of dental crown that are used to cap teeth that may have previously been damaged or decayed. They are made to look just like your natural teeth, and can restore your smile without the need of invasive procedures. After an initial consultation, if Dr. Dankworth recommends porcelain crowns as part of your smile restoration plan, the caps are gently placed on your prepared teeth and can be a fast, effective and long-term remedy. A damaged tooth that does not necessitate porcelain crowns sometimes requires more extensive treatment than a filling can provide. Inlays and onlays, sometimes referred to as indirect fillings, are highly durable and can restore a damaged tooth to its natural look and function. Inlays lie in the chewing surface of teeth, while onlays cover one or more cusps. High Quality | We use top-quality materials to create your white fillings, ensuring that they will be long lasting and reliable. Color Matching | Gone are the days of unsightly metal fillings that can be obviously distracting. Our dentists specialize in mercury-free composite fillings that match the color of your teeth. Virtually undetectable, white fillings are the perfect choice to repair a lurking cavity. Extra Support | Another extra benefit of white fillings compared to metal fillings is that tooth-colored fillings bond to your tooth, giving it the extra support it needs. Oral Health | Cavities are often the initiators of more serious oral health issues. With regular visits to your dentist and proper maintenance, your new, white fillings will remove the cavity and prevent it from returning. Tooth colored fillings can also replace the metal amalgam fillings that have been shown to leak mercury that can cause other, more serious, health issues. Call our Carlsbad dental office today to find out more about tooth-colored fillings and porcelain crowns, and how white restorations will give you a beautiful, healthy new smile! We are located in Carlsbad between Encinitas and San Marcos, CA.